A best-seller for over 20 years, the Original Swiss Peeler's popularity shows no signs of slowing down. The Swiss Stainless Steel Peeler can be used to cut decorative grooves into fruits and vegetables. Features an integrated side cutter for removing potato eyes or blemishes. 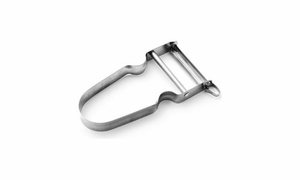 This French-made stainless steel peeler with a straight blade is an indispensable tool to have in your kitchen.